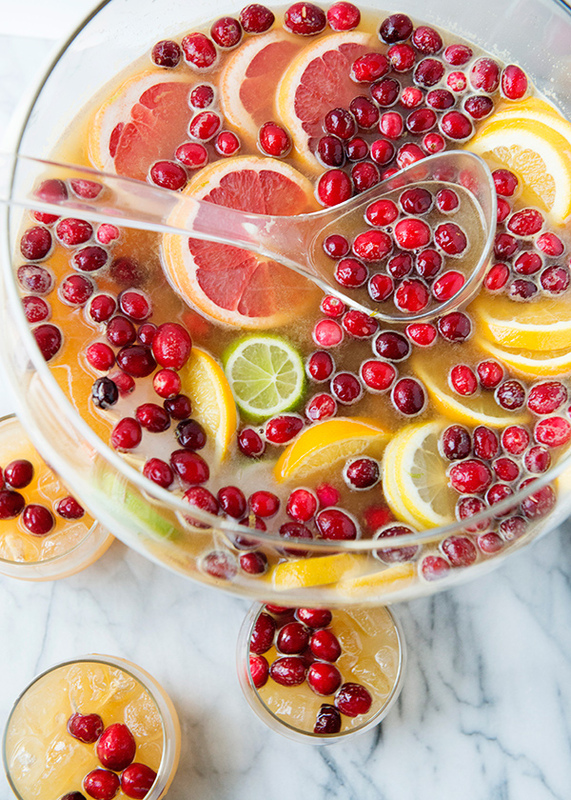 It is described as a kinda citrus sangria – a great way to add some festive cheer to the table during the cold, dark and wintry nights. It also looks so good that it can easily double up as a table centrepiece too! The night before, make a ice ring. Fill a container with slices of fruit and cranberries and let it freeze solid. This prevents the punch from getting watery by adding a lot of ice cubes, and it looks pretty. combine the sugar, zests, ginger and cinnamon. Rub the zest between your fingers to release the oils. Let sit at room temperature for 4 hours or up to a a few days in an airtight container. Peel the skins off the fruits and juice, using a juicer. Place in a pitcher or jug and chill it in the fridge ahead of time. Now to make the punch: add the sugar to the bottom of the punch bowl. Pour in the chilled juice and stir well to dissolve the sugar. Next pour in the alcohol as well as the sparkling water. Now get that ice ring that was made earlier. Dip the container in a bowl of water for 10 minutes; the ice should pop right out. Add the ice ring to the punch bowl. Garnish with the frozen fruit and cranberries.